A feast-day reflection on being “united in one heart” | Walk with us! 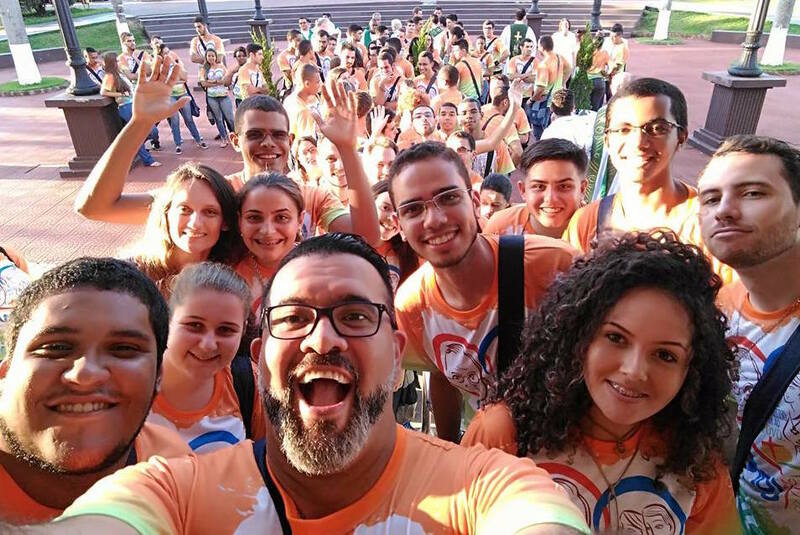 During my pastoral year experience in Brazil, I had the opportunity to reflect about the meaning of Ecce Venio, Ecce Ancilla, and the real meaning of going out of the sacristy to be among the poor and marginalized. This experience has been really important in my discernment and my desire to give my life completely to the service of God in the Congregation of the Priests of the Sacred Heart. Learning about the spirituality of Fr. Dehon from members of the congregation here in Brazil has been also very important in the growth of my vocation. In my stay here I have truly been able to experience being united in one heart, the heart of Fr. Dehon in the love for the Sacred Heart of Jesus which is his legacy to us as Dehonians. I have found that the congregation here in Brazil has many different and rich ministries. And I use the word “rich” to refer to the active and loving participation of people of the community here in different ministries we have such as our parish ministry, youth ministries, programs serving communities in rural areas, and many others. In this way, this experience has revealed to me how rich our labor is as Dehonians. It has helped me understand our internationality and how we meet the needs of people in the places in which our congregation is present. It has also helped me understand that the service that we offer to others is the true meaning of our vocation and that our call to God takes its meaning from that service. As we prepare to celebrate the feast of the Sacred Heart I have had some time to reflect upon that great love to the Sacred Heart of Jesus that is a legacy from our Founder, Fr. Dehon. In the same way, I have also reflected upon the words of our General Superior Father Heinrich Wilmer, SCJ. His recent letter to the congregation gave me many wonderful ideas to reflect on. And in my case two main ideas stuck in my heart as they are very close to the experience I have had in Brazil. Just as Fr. Wilmer says when he cites Martin Buber, I have come to realize that “Only with a You do I become an I.” This, in my opinion, is the foundation of our vocation as Dehonians. We have been called to live among the poor and the marginalized, people who are in need and struggle in their daily lives. It is from the people we serve that our vocation takes its meaning and is fully realized. During my experience in Brazil I have visited very poor places far from the cities. During that time I came to understand that as I was helping people they were helping me in understanding the true value of my vocation. Of course, I would be lying if I said that every experience I have had was nice because many involved problems or difficult situations. The tough times included super hot weather and a lack of air conditioning, taking super cold showers in cold weather, and dealing with the death of one of the parishioners five minutes before mass. There was a drunk man screaming in a loud voice while I was giving a reflection during mass. Also the difficulty of being surrounded by a horde of mosquitoes during mass. But even when times were challenging, I always realized that I was experiencing growth in my vocation and that what I was doing and enduring was for service to others. “It is only with a You that I become an I.” And I have to say that it is because of You my brothers in community, priests, brothers, all of those in formation that I become an I, and even those who for many reasons are no longer with us in the congregation that I have become an I. That is because “You” means all the people who work with us daily, helping us in many ways to continue our labors and mission. It is because all of You that I have become a Dehonian. It is because all of You that I and the Dehonian charism have become one. The second important message in the letter from our Superior General Fr. Wilmer is something that is not new in my reflections and that was very important in my decision to come to Brazil. This is something we have heard many times from Pope Francis, but that is also a tremendous legacy and message from Fr. Dehon: “Get out of the Sacristy.” As Pope Francis says: “The Church must go out, go to the people there where they live, where they suffer, where they hope.” This is not just an invitation, but a command that clearly reveals our identity as Dehonians. Going out to the people, going out to encounter and experience their needs. Many times their suffering and struggles help us remember how privileged our lives are because of all the things we have and help us to live lives without struggles. Thanks to my experiences in Brazil I have grown in my identity as a Dehonian and a missionary. I have grown in my spirituality and my desire to give my life completely to the service to my brothers and sisters. And I know that I am not alone, because I have my brothers in community that continually help me to become a better person and future minister. As we celebrate the Feast of The Sacred Heart, I can see how we are united in one heart. the heart of Jesus that was pierced because of the great love to us and to God the father. We are united in the heart of our founder Fr. Dehon who saw in the Sacred Heart of Jesus a fountain of inspiration and love. Today I know that it does not matter where we are… Brazil, United States, Poland, India… because we are all united in one heart. We are Dehonians.